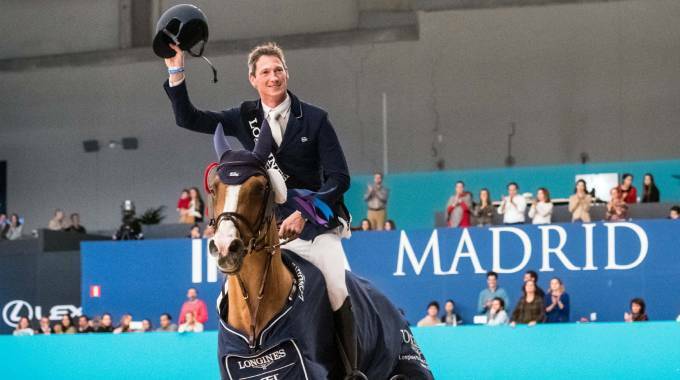 Madrid, November 25, 2018 - Germany’s Daniel Deusser (37) rocketed up to third on the Western European League leaderboard and booked his ticket to the Longines FEI Jumping World Cup™ Final in Gothenburg, Sweden next April when posting his second win of the 2018/2019 qualifying season at Madrid in Spain today. He topped the line-up with Calisto Blue in Verona, Italy last month, and in today’s sixth round of the 13-leg series he steered Tobago Z to the quickest time in a tension-filled 10-horse jump-off to take maximum points once again. Karlsson led the way against the clock with a beautifully-ridden, fast and accurate ride on the lovely 10-year-old mare Ida Bisschop to set a strong target in 48.28 seconds. But it was like watching a piece of precision engineering as Deusser’s handsome Zangersheide stallion shaved 1.55 seconds off that with effortless ease when fifth to go: "We found a good rhythm from the first to the second, and it lasted to the very end of the course. Tobago is very careful and very scopey, and he’s not a hot horse so that really helps in the jump-off because he never rushes even when he’s under pressure - you get the same jump whether you are going fast or slow". Fredricson was fully focused as he set sail with H&M Christian K, but an unscheduled stop at the third fence put paid to his chances and when the pair completed with a total of 16 faults they lined up in tenth place. Deusser, currently world no. 7, was really pleased with his horse’s performance today.